An infantry fighting vehicle (IFV), or mechanized infantry combat vehicle (MICV), is a type of armoured fighting vehicle used to carry infantry into battle and provide direct fire support. The Treaty on Conventional Armed Forces in Europe defines an infantry fighting vehicle as "an armoured combat vehicle which is designed and equipped primarily to transport a combat infantry squad, which is armed with an integral or organic cannon of at least 20 millimeters calibre and sometimes an antitank missile launcher." Infantry fighting vehicles are distinct from armoured personnel carriers (APCs), which are transport vehicles armed only for self-defense and not specifically engineered to fight on their own. Consequently, IFVs possess heavier armament than an APC, and the attached rifle squad fights from within the vehicle more often than in an APC. IFVs also often have improved armour and some have ports which allow the infantry to fire personal weapons while on board. They are typically armed with a 20 to 40 mm caliber autocannon, a coaxial machine gun and sometimes anti-tank guided missiles (ATGMs). IFVs are usually tracked, but there are some wheeled vehicles too. IFVs are much less heavily armed and protected than main battle tanks, but when equipped with larger cannon or ATGMs may pose a significant threat to all but the heaviest armoured fighting vehicles. 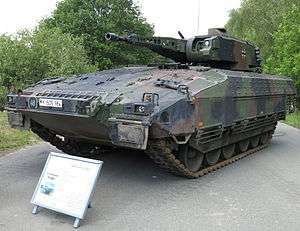 The first mass-produced IFV was the West German Schützenpanzer 12-3 which served in the Bundeswehr from 1958 until the early 1980s. The SPz 12-3 mounted a 20 mm autocannon in a small turret and carried a half-squad of five armoured infantrymen. Western powers were surprised when the Soviet Union paraded the BMP-1, in 1967. The BMP possessed a very low profile and was armed with both a 73 mm smoothbore gun and an AT-3 Sagger ATGM, making it the first combat vehicle with mounted cannon and missiles in addition to a mounted infantry squad. Its steeply-sloped front armour offered full protection against NATO's standard .50 calibre machine gun and partial protection against a 20mm Oerlikon autocannon both in a 60 degree frontal arc, while its armament posed a threat to lighter NATO APCs and even main battle tanks. Soviet infantrymen could thus enter a hypothetical engagement in a vehicle that possessed formidable fighting capability in its own right. This brought combined arms integration to the lowest tactical level. The Ratel was the first wheeled IFV to see significant armour combat, engaging Angolan tanks during the South African Border War. In 1971, the Ratel was designed to a South African specification for a wheeled combat vehicle suited to the demands of a high-speed offensive that combined maximum mobility and firepower. The emphasis was on mobility in particular, as it had to keep pace with a rapid mechanised advance and cross hostile ground quickly. South Africa's motorised units had carried out prior deployments on unprotected Bedford MK and Unimog trucks, but these were deemed unsuitable for the harsh African terrain. They also offered few advantages in mine protection, while the Ratel's blastproof hull was developed to withstand even the most catastrophic anti-tank mine explosions. During the South African Border War, Ratels equipped with a 90 mm gun adopted from the Eland-90 were utilised as improvised tank destroyers to varying degrees of success. After the BMP and the Ratel, several other countries followed suit in embracing the concept, including the United States, which adopted the M2 Bradley, the United Kingdom the Warrior, and West Germany the Marder. Other examples include the Japanese 89FV, the Chinese ZBD-97, the Indian Abhay, the Canadian LAV III, the Spanish ASCOD Pizarro, the Italian Dardo, the French AMX-10P and VBCI, and the Swedish Combat Vehicle 90. In most Western IFVs, the comparatively large smoothbore guns on the BMP and later variants of the Ratel have now been discarded in favour of smaller calibre autocannon. While the former enjoyed a tank-killing capability that most autocannon lack, their low rate of fire and mediocre individual accuracy offset this advantage. Combat applications in close-combat environments are likely to drive up survivability requirements necessitating the same protection level required by most tanks. In times of asymmetrical warfare, local crises, and urban combat, the IFV is more important than ever. 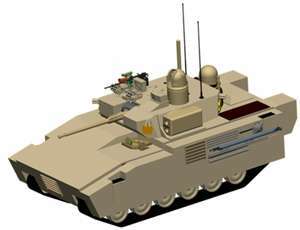 The IFV offers a viable compromise between mobility, protection, and firepower. They can be used in high and low intensity conflicts as well as peacekeeping operations. The latest vehicles, like the Patria AMV, have been designed with an emphasis on modularity that improves their ability to be repaired in the field. Infantry fighting vehicles are typically well armoured, although usually with less protection than main battle tanks. Typical armament is an autocannon and machine guns. IFVs have a door for dismounts. Generally, IFVs have thinner and less complex armour than tanks to ensure mobility; for instance, variants of the U.S. Bradley weigh around 30 tonnes, while its MBT stablemate, the M1 Abrams, is roughly twice that. Most IFVs are resistant against heavy machine guns, artillery fragments, and small arms. The IFV's mission does not include anti-tank duties except in support of tank units or in emergencies; therefore, it needs less protection from heavy weapons fire. Instead, the IFV, as its name implies, is supposed to carry riflemen and their weapons into the battlefield where they dismount and fight outside the vehicle with the support of the IFV's main armament. In IFVs, the thickness of armour varies widely between models. Some vehicles are proof against .50 in (12. mm) bullets while others, such as Sweden's CV90 and Russia's BMP-3, can withstand frontal hits from 30 mm autocannon. The sides, roof, and floor of IFVs have thinner armour. Vehicles must also protect crew against anti-personnel mines and against anti-tank mines. Newer vehicles like the Finnish Patria AMV use armour made in interchangeable modules of various thickness. This permits the vehicle to be tailored for particular missions such as decreasing the weight of vehicle for air transportation or strengthening the protection if it engages in dangerous missions. The latest models of the Russian BMP-3 use the Arena active protection system (APS) that protects the vehicle from missiles and rockets with velocities from 70 to 700 metres per second. Israeli IFVs will soon employ the Iron Fist (countermeasure) which can defeat kinetic APFSDS tank rounds. The most common countermeasures are smoke grenade dischargers. These help IFVs to avoid attacks from ATGMs by providing a smoke screen. Some vehicles, such as the French VBCI, employ infra-red jamming flare dispensers. These are effective against missiles with IR guidance systems. The term Heavy Infantry Fighting Vehicle (HIFV) is often applied to IFVs that are as heavily armoured as a main battle tank. An example of a HIFV is the Russian T-15 Armata, which is based on the same chassis as the T-14 main battle tank. 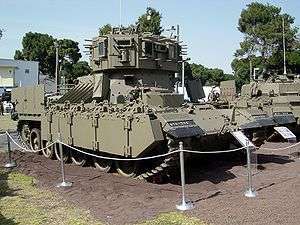 The Israeli Namer is based on the Merkava IV main battle tank chassis and, although officially an armored personnel carrier, does have the capability to be equipped with an autocannon in a remote unmanned turret, thus making it a true HIFV. A Marder of the German Army fires a MILAN anti-tank missile. The primary weapon on most IFVs is an autocannon, usually of a calibre between 20–40 mm, although the BMP-3, ZBD-97 and BMD-4 carry a 100 mm gun-launcher along with a 30 mm autocannon. It is effective against a wide range of targets such as unarmoured and lightly armoured vehicles, infantry, helicopters and low-flying aircraft. It can fire several types of munitions, including high explosive, incendiary, and kinetic penetrator rounds. Germany's Puma and Sweden's CV90 can fire air burst munitions that contain hundreds of tungsten rods that are effective against vehicles, helicopters, and stationary strong points. IFV cannons can elevate their barrels by as much as 70 degrees to permit their crews to engage aircraft. On many IFVs, a coaxial machine gun is mounted on the turret along with the main armament. The most common calibre is 7.62 mm (.30 cal); usually in form of 7.62×51mm NATO or 7.62×54mmR. Some vehicles mount more machine guns; for example, on the German Marder, one machine gun fires from the rear of the vehicle, and the Russian BMP-3 has two machine guns mounted in the hull facing forward. Many IFVs utilize firing ports allowing infantry to fire without leaving the protection of the vehicle. Some IFVs are equipped with anti-tank missiles. These missiles are mostly medium range (2000–4000 m), though some such as 9M117M1 Arkan has a range of 5,500 m. Others may carry surface-to-air missiles or a combination of the two, such as the 2T Stalker. Some new vehicles, such as the BTR-90 or Puma, come equipped with 30, 40, 76, or 81 mm grenade launchers. Most IFVs also have smoke grenade dischargers for concealment. Some IFVs are amphibious and air transportable. A few, such as the Soviet BMD series or the Chinese ZBD2000, can be deployed by a parachute system from aircraft directly into battle. Because of their usually lighter weight compared to main battle tanks, IFVs can be transported by a wider variety of cargo aircraft, and they can cross bridges that heavier vehicles could not. Wheeled IFVs can travel great distances on their own without needing to be transported by flat-bed trucks and railway, as required by tracked IFVs. Tracked IFVs need to have their treads serviced or replaced on a regular basis. The tracks themselves and the weight of the IFVs tend to be tough on road surfaces, wearing them down more quickly than a wheeled IFV. Many wheeled IFVs can extract themselves from a battlefield with specialised run-flat tires when not operating in difficult terrain, while an IFV with damaged tracks would require its tracks repaired in the field or an armoured recovery vehicle to tow it out. However, tracks cannot be punctured like a tire so are more difficult to immobilize. A weapon that destroys a track will do significantly more damage to a wheeled vehicle (such as destroying the axles in which case the vehicle will have to be towed away as well). Tracks also offer far greater off-road mobility, greater obstacle climbing capabilities and greater maneuverability than wheels. Unlike a wheeled vehicle, a tracked vehicle will not be stopped by a spike strip or roadblock. A tracked vehicle can reach places a wheeled vehicle can not. As IFVs often operate alongside tanks, being tracked means that the vehicle can go everywhere that the tanks go, which a wheeled vehicle could not. In this case wheeled vehicles would either have to take another route (leaving the tanks without IFV support and the IFVs without tank protection) or the tanks would have to stay where the wheeled IFVs can go and drastically limit their own tactical mobility. Tracked vehicles can attack and operate from and in areas which a wheeled vehicle could not which is a great tactical advantage. A wheeled vehicle is limited to roads and less difficult terrain which may enable the enemy to predict where they will come from. Generally, therefore, tracked vehicles have greater mobility except on roads where wheeled vehicles have a greater top speed. Many countries only use wheeled armour for support functions or low-risk peacekeeping missions whereas combat functions are performed by tracked vehicles. A compromise between wheels and tracks is the band track, which combines some of the advantages of wheels and tracks. The mobility offered by IFVs is an asset in close combat, especially against fixed artillery. American military simulations in the 1980s concluded a three to five-fold increase in artillery defence effectiveness when IFVs were deployed. Throughout its life cycle, an IFV is expected to gain 30% more weight from armour additions. This complicates the design by requiring additional power. 1 2 3 4 Isby, David C. Weapons and Tactics of the Soviet Army, Jane's, 1988, ISBN 978-0-7106-0352-4. 1 2 3 Scholtz, Leopold (2013). The SADF in the Border War 1966-1989. Cape Town: Tafelberg. ISBN 978-0-624-05410-8. ↑ Heitman, Helmoed-Römer. South African Arms and Armour - A concise guide to armaments of the South African Army, Navy, and Air Force. Struik Publishers 1988. ISBN 0-86977-637-1 p 47-51. ↑ Bridgland, Fred (1990). The War for Africa: Twelve months that transformed a continent. Gibraltar: Ashanti Publishing. p. 194. ISBN 978-1-874800-12-5. ↑ Scott Boston (Winter 2004). "Toward a Protected Future Force" (PDF). p. 67. Retrieved 3 July 2011. ↑ "KMDB - BMT-72 Heavy Infantry Fighting Vehicle (T-72 MBT Upgrade Version)". morozovkmdb.com. Retrieved 2015-05-22. ↑ Jonathan B. A. Bailey (2004). Field artillery and firepower. Naval Institute Press. ISBN 1-59114-029-3. Retrieved 7 March 2011. ↑ Royal United Services Institute for Defence and Security Studies. Method Publishing. 2004. p. 30. Retrieved 31 March 2011.